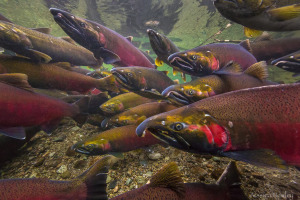 Spawning Coho Salmon are one of the most attractive fish. This is a BIG fish with an average length of 28 inches, occasionally reaching 36 pounds. This fish is currently “in season” at the processing plants on the docks of Bellingham Bay. I know this first hand because I am a fish flinger.